The Society of International Nature and Wildlife Photographers have announced the winners of the Creatures Great and Small Photography Competition. For this competition we asked to see animals, insects, fish all life big or small in this months competition, anything from big to small. Michelle Howell from West Yorkshire, England was chosen as the winner from over 530+ images entered in to the competition. Michelle has won 12 months membership to The Society of International Nature and Wildlife Photographers (SINWP) organisation. Michelle says ''Thank you so much for choosing my image! I look forward to using my membership and joining in more of your competitions. 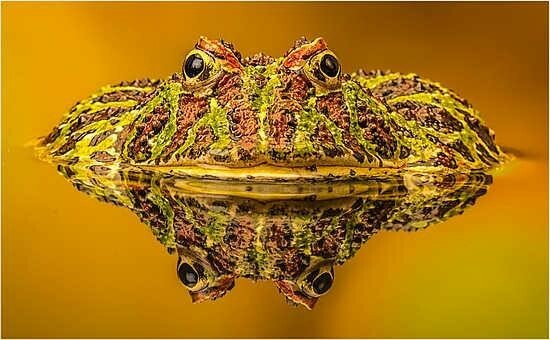 The image is a macro image of an Argentinean Ornate Horned Frog taken in a reflection pool." The image was shot on a Nikon D5100 with a Tamron SP 90mm F2.8 Di VC USD Macro 1:1 F004N Lens. There are 2 runners up Sheri Emerson from Newfoundland, Canada and Stuart Walker from Essex, England both won 6 months memberships respectively.